Established in 1958, the Hollywood Walk of Fame honors achievements in movies, TV, radio, music and theatre. It currently covers 18 sidewalk blocks in Hollywood, with over 2,400 stars. Each year the Walk of Fame Selection Committee receives on average 200 nominations. Recipients must have worked five years in the industry and attend the unveiling ceremony to be eligible; a $30,000 fee is also required. During our Californian trip in 2010, I couldn’t resist a high kick next to John Philip Sousa‘s star (happy belated birthday!). 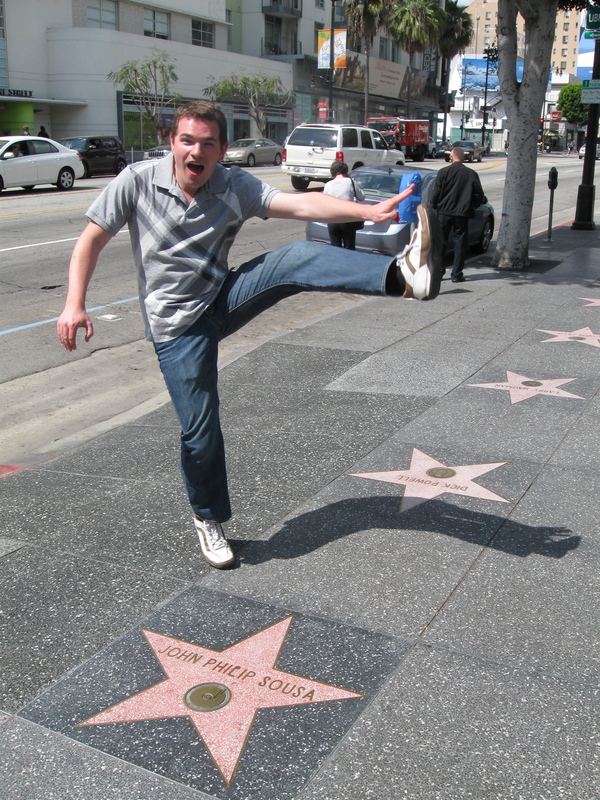 This entry was posted in High Kick Photos and tagged High Kick, Hollywood Walk of Fame, John Philip Sousa. Bookmark the permalink.